Activity Level - Fun movement based activities. Age Group - 3/ 3.5 years old up to 5 years. 5 year-old children not drawing representational pictures of people and objects. Cost - $ 85 per session. Private Fund rebateable*. This is a group designed to work on using hand tools such as pencils, crayons and paint. For Children 3.5–5 year-olds (Pre-kindy & kindy kids). For children who are not yet drawing representational pictures of people and to build their hand skills and visual motor coordination in using tools. Tools such as crayons, pencils, pens, glue sticks, cotton wool sticks, rolling pins. We want your children to have happy memories around craft and drawing skills. Picking up a pencil or a paint brush will improve pre-writing skills, build confidence and your child may start to choose to do fine motor drawing tasks at child care and kindergarten. Who cares if their drawing doesn’t look like something, as long as they get more practice and they feel more motivated to try drawing and craft at kindy because these skills are the precursor to handwriting control and skills. The more practice in using hand drawing tools the more likely they will ‘give handwriting a go’ in Prep. We want you children to develop language around their drawings so they start to build conceptual ideas around what the picture is, where is the picture set etc. If we can get them to put pencil to paper and slowly build skills, your child should start to draw early shapes and pictures of faces. Shapes are precursor to drawing representational pictures and the more refined curves and lines in letter writing. 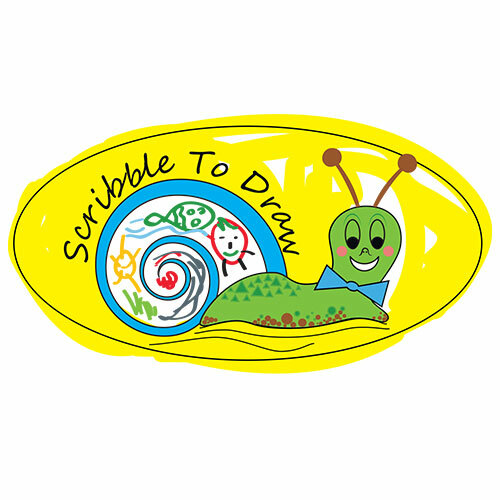 Come out and play at ‘Scribble to Draw’ and help your child be one step closer to being less aversive to writing letters when they eventually get to school. Gaining ability to draw intentional lines and shapes helps our hand motor control. Refining motor control will support later handwriting skills. Some children are not yet drawing pictures that look like things this is a group to help kids gain more practice in using pencils and paper. Scribble to draw is just the beginning to working towards more representational pictures and shapes. Our group program ‘Sharp Shapes’ builds on from this group. individuality – every person has the same features but looks slightly different. Using different shapes to make trees, house and flowers (developmental shapes such as circle, square and cross) – this is more worked on in our, ‘Sharp Shapes’ group. Encourages about drawing pictures of an incident or a scene in a story book. While they draw (where it is representational or not) it allows them to organise their thoughts and think about the scene, what is happening in the scene and shat is going to happen next. Visual memory – preproducing shapes already practiced or reproducing objects previously seen. Taking part of a drawing or shape on the page and turning it into something. For example, a rectangle could be a car. Motor planning – more practice coordinating hand and arm movements when using a pencil or a tool such as a paint brush. The more practice the better the quality of movement ready to be efficient when learning to handwrite. Spatial Awareness – knowing how big one person is relation to another, knowing how small eyes are and where they are placed in relation to the nose and learning to use the whole page for your picture rather than the bottom right hand corner. These are all important skills for school readiness and you can start early 3 – 3.5 years old. The more practice the more these skills will improve ready for school. Please note this is an early intervention group o there is no expectation that your child has done much drawing.